Carmel Valley is a vibrant, culturally-rich society area located in one of the most comfortable climates in the world. The nearly perfect year-round temperatures make outdoor recreation and entertainment a huge part of the luxury lifestyle you’ll find in the San Diego area. 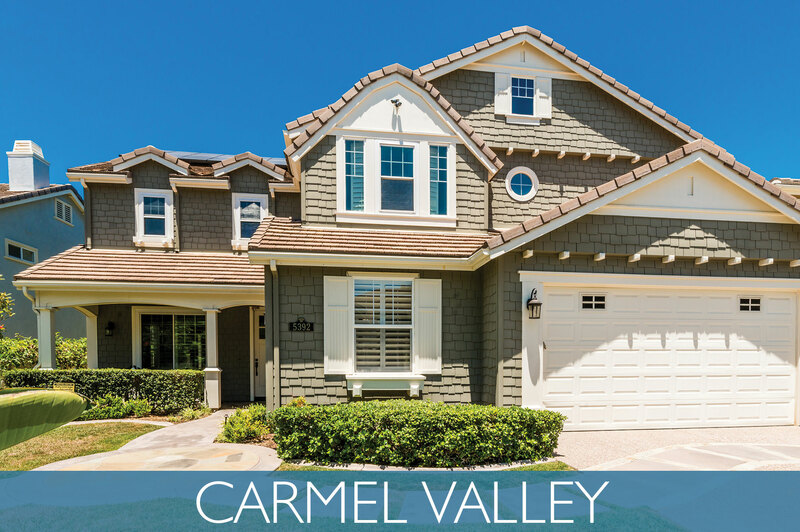 Nestled conveniently at the intersection of I-5 and I-805, immediately north of La Jolla’s “Golden Triangle” and University of California at San Diego, Carmel Valley offers quick access to major thoroughfares, desirable commercial zones, and outstanding schools. Carmel Row, a new development of townhomes are nearing completion and selling now! These contemporary homes have low-maintenance design and wonderful floorplans. View more about these properties here. Carmel Valley opened a new shopping center, The Village at Pacific Highlands Ranch, near Canyon Crest Academy. They are also opening a new elementary and a new middle school. View more about Carmel Valley on Pinterest! The master planned community is located in the North part of San Diego and features real estate ranging from luxurious, privately gated properties to single family homes to townhomes and condos; Carmel Valley is truly a city that offers the perfect location with the perfect home for everyone’s needs and wants. Rancho Santa Fe, La Jolla, Del Mar, and Fairbanks Ranch are all easily accessible. While Carmel Valley is very large, it is not an official town, so residents benefit from living in the center of several of the nationally top-rated school districts. The prime location and many community amenities and luxuries make Carmel Valley one of the most highly desired communities in San Diego to buy real estate. The Solana Beach School District (grades K-6). A new elementary school, Solana Ranch, will open for the 2014-2015 school year. The San Dieguito Union High School District (grades 7-12), which includes the top-rated Torrey Pines High School and the new Canyon Crest Academy. Carmel Valley places children and family life in the spot light, as can be seen from the huge focus on providing outstanding education. The family-oriented community offers family entertainment through the various parks and the local library. The Carmel Valley Library offers two different music series, story times, arts & crafts, book clubs and more, while the Carmel Valley Recreation Center hosts numerous classes and activities for kids and adults to enjoy, including swim lessons, dance, team sports, art, gymnastics, and bridge. There are concerts held throughout the summer months that also provide great family entertainment, as well as a wide variety of shopping and dining options, ranging from luxurious and exclusive to family friendly. The main shopping area is located at Del Mar Highlands Town Center, which features its own summer concert series in August. The other two shopping areas, Piazza Carmel and Carmel County Plaza host numerous seasonal activities for the community.